The only requirement for setting up a C-Cubed add-in floating license server is to ensure that the TCP port used by the license server is open for incoming traffic. The port number is included in the email you received with your floating license key. Contact your system administrator for help in opening the port in your firewall. You can also refer to one of the following articles for the steps required to open the port on the computer hosting the C-Cubed license server. 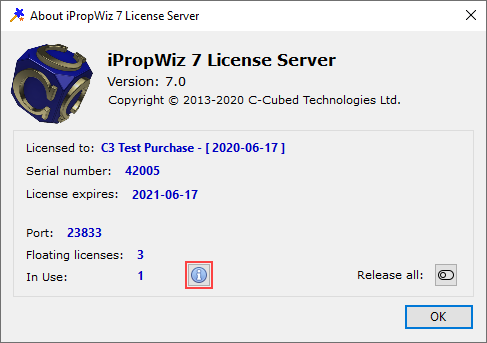 Note that floating license servers for different C-Cubed add-ins operate through a different ports. You will need to open a specific port for each license server hosted on the server. Each floating license server installation includes a stand alone application that displays the current state of the floating license server. The tool is located in the same folder where you unzipped the license server files. The name of the application is typically About[add-in name]LicServer.exe where [add-in name] is the name of the application. Do not move the file from this folder. When you run the tool, a general summary of the license server is displayed. Click the List Licenses button to show more detail. Click the Copy button to copy the list of current license users to the clipboard. 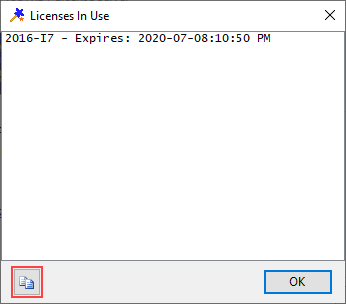 If the About dialog reports the serial number as Unknown, or the number of floating licenses is reported as zero (0), a problem exists with the license server. To remedy the problem you must uninstall the license server and reinstall using the procedure found here.